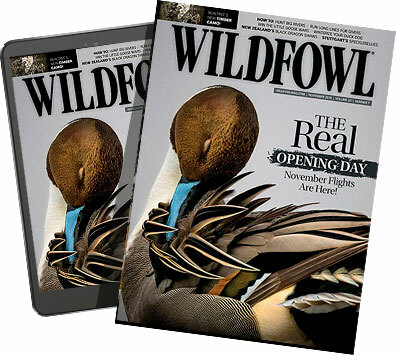 To help you find the perfect Father's Day gift this year, the WILDFOWL staff has compiled some of the most innovative and must-have gear for Dad. From durable decoys to dependable waders, no matter how much you're looking to spend, there's something here that should fit your budget. It's hard to believe the original Super Black Eagle has turned 25. Continuing the legacy, the Benelli Super Black Eagle II is an inertia-driven, souped-up version with a brushed-nickel bolt and oversized handle featuring a tough Cerakote finish in Realtree Max 5 or black. The barrel and chokes have Benelli's Crio deep-freeze treatment for excellent patterning. Made with the same guts used to win two world championships, the Workhorse produces rich, deep low end for mean murmurs but can get responsive for quick hiccups and double clucks. Embrace the rain and wind with the Gore-Tex hardshell Delta, which creates a weather-proof barrier between you and Mother Nature. Lightweight and uninsulated, it's a perfect compliment to the mid-layer Duck Oven in late-season. Banded reduced the chance of seepage by minimizing stitches that fail. The boots are welded at the seams, and exterior fabric is tough with reinforced leg and shin guards. Breathable (60-gram Primaloft), the Black Labels have 1,600-gram Thinsulate boots. We fell in love with the Versa Max, then the V3 came out...Remington has made us a bunch of gun-cheating two-timers. The action springs have been moved forward in the V3 from the stock to inside the receiver. Gas ports in the chamber help cycle any 2¾- or 3-inch load. The rotating bolt makes lock up secure and fast. There's an old saying: "you get what you pay for." And that's why we save up and buy Big Foot decoys whenever we can. With precise feather tracking, the new pintails are as real as it gets, and the durable paint process means you'll hand them down to your kids. Cowboy Fernandez created the original Yentzen back in the '50s, but few know he also developed the first triple-reed. Cut from black walnut, the proven Sure-Quack system offers natural sounds with the slightest bit of air. Don't show up to duck camp like a rookie with that $4 Styrofoam cooler you bought at the 7-Eleven. The new soft-sided tan Hopper (available in sizes 20, 30 or 40), keeps fresh kills fresh for the trip home with 1.5" of closed-cell insulation and Hydrolok zipper. This compact backpack is ideal for walk-ins. It holds a ton of gear without being too cumbersome. The Stump Jumper has plenty of pockets for sunglasses, ammo, or a water bottle. It easily hangs from a tree or fits nicely inside a layout. Ditch the plat book and download this app to your smartphone, tablet or laptop. OnX shows private and public land boundaries with state-specific layers. It's a great tool for hunting unfamiliar areas so you can connect with landowners and get permission.